More than 500,000 Marriott International employees and workers across its global network have now been trained in how to identify situations where human trafficking may be taking place within its hotels, the company has announced. 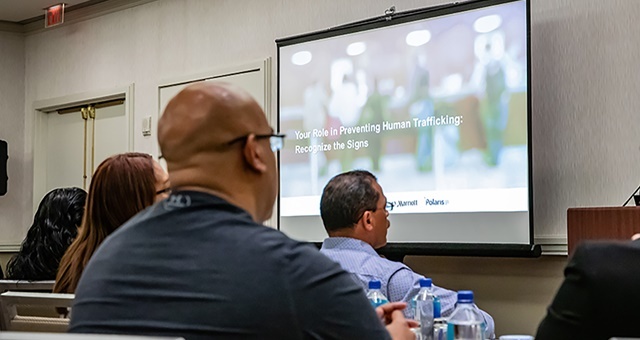 In addition to noticing the signs which may signify a red flag and cause to investigate, Marriott workers are being taught the best ways to respond in order to save both adults and children from international trafficking syndicates and crime groups operating around the world. First launched in January two years ago, the mandatory internal awareness and training program was rolled out to on-property staff as part of its group-wide ‘Serve 360: Doing Good in Every Direction’ sustainability and social impact platform. Prior to its launch, Marriott spent nearly a year building the program in collaboration with two non-profit organisations specialising in fighting human trafficking, ECPAT-USA and Polaris. Training materials were made available in 16 languages, able to be absorbed either online or in classrooms, across the 130 countries in which Marriott International operates. The training has had an impact, with multiple instances reported where young people have been removed from dangerous circumstances. More than 500,000 employees globally have now taken the training, with success already being seen. Marriott International Chief Global Human Resources Officer, Dr David Rodriguez, said the fight against modern-day slavery begins with awareness and being able to report it to management or the appropriate authorities. “Hotel workers wouldn’t necessarily see a human trafficker visibly restraining a victim; they would typically see a scenario that is much more nuanced and harder to detect if you don’t know what to look for. “That’s why helping hotel workers identify the signs of sexual exploitation and forced labour is so important. “This knowledge gives them confidence that they can do something to help, which is already having an important impact in our hotels. “Hotels can unfortunately be unwilling venues for this unconscionable crime,” he added. During the course, hotel staff are trained to notice, investigate and potentially act on a number of potential warning signs. These include guests arriving with minimal clothing or luggage; multiple men being escorted to a guest’s room; spotting the signs of disorientation or communication irregularities and guests who insist on receiving little to no housekeeping services during their stay.